Today is Memorial Day when we honor those who have served and/or died for this country. One of those military members was my Dad. He was killed in Vietnam in 1968. To those members of the Armed Forces who answered their country’s call, I tip my hat and say thanks. This entry was posted in Findlay, History, Life and tagged honor, Memorial Day, military, patriotic, service, Vietnam, war, war dead on May 30, 2011 by Doug. I created a memorial page for my Dad so I can honor him every day of the year not just on Memorial Day. 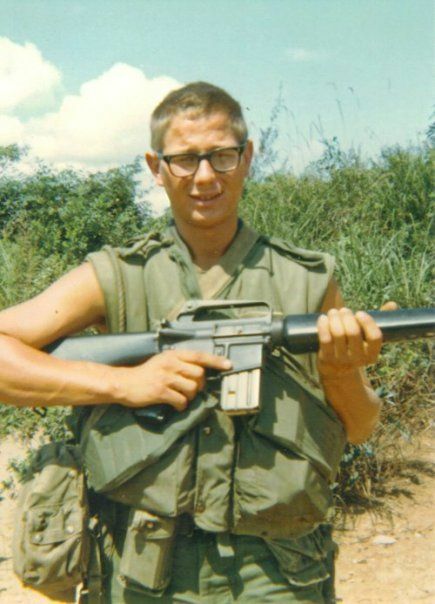 He was killed in action in Vietnam in February 1968. This entry was posted in Culture, Findlay, History, Life, Politics and tagged Memorial Day, military, remembrance, Vietnam, war, war dead on May 31, 2010 by Doug. This past weekend visited my hometown of Findlay. It has been awhile since I visited last and I like to say that my Mom was forcing me to visit (that’s sort of true) but my visit was also for a milestone in my life. 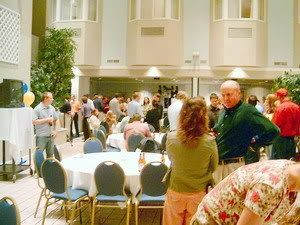 Saturday, I attended my 20th High School reunion. I was both very nervous and very excited to see my former classmates. Some of us attended elementary and junior high school together before Findlay High. Most I have not seen or heard from in years. Truth be told I had a good High School experience. By my senior year I had accomplished several major goals like getting on the honor roll (FINALLY), playing on the football team, worked on Trojan TV (I sucked as a play-by-play announcer), directing a one act play, being a class speaker at graduation, and getting into a major college (Ohio State). Those things allowed me to hang out on the fringe of the cool kids group – the ones who spent more time on extracurricular activities than they spent in school and still got good grades. I was worried that I wouldn’t see anyone I wanted to see – either I may not have liked them 20 years ago or I didn’t really know them. I saw a preliminary list of those attending and there did seem to be a few people I did want to see again. Whew! Of course the other side of the coin was – did they want to see me again. HA! High School was also good for me because the people who use to bully me either grew up (which is what happened in most cases) or attended the vocational school next door so I spent no time with them – except Health class Sophomore year when all the “shop rats” were in my class. Imagine what hell would be like (if it existed) and my Health class that year was worse. But there was some fun moments then like seeing the reaction when the VD movie was shown with close ups of various private areas infected with various VDs, the drug movie and the scene when the heroin addict strokes out on screen, and our teacher showing the class the 3-D relief model of the male reproductive organ and then asking one of the giggling girls if she wanted to take it home….. (this was way before teachers could lose their jobs for doing that). — ah, good times…. The festivities started Friday night at the football game where there was a section roped off for us. Then Saturday night was the party at a local banquet center. At the game, our team played Worthington Kilbourne and we won, 34-7. It helped our classmate Mark Ritzler get his first win as new head coach of the Trojans. There was some discussion that we all may need to come to all the rest of the games as a good luck charm for the team. Also at the game, but who didn’t attend the party on Saturday, were two Bobs that I have known since elementary school and Little League. We played on the GM Red Sox. I believe that team was coached by Mr. Nichols, who would become our Jr. High phys ed teacher and later a long serving Findlay city council member. At the time I was discovering that I needed to wear glasses. During one hard practice, Mr. Nichols, tired of me striking out put the ball in his hand and ordered me to hit the ball. I looked at him and he said it again so I swung the bat at full speed and smashed it into his hand. One or two expletives spilled out but at the pain not at me. I got glasses soon after that. During my season on the Red Sox I had 2 base hits. The party on Saturday night was a good time. One of the guys, Chad, I hung out with starting in Jr. High was there. I hadn’t seen him since graduation day. One of my other friends from Jr. High, Tim, was also there (he had been at the game too). I hadn’t seen Tim since the last reunion I attended back in 1996. People said to me that I didn’t look any different than I did in High school. Other people looked pretty much the same. There were some who looked very different. One of the ones who was very different was a guy named Jim. Back in High school he was one of my bullies. He was a stoner and most people remembered him because he use to sleep during study hall. Saturday night he looked normal. I actually was glad he changed and that he attended the party. Just like in high school the clics from back then reformed during the party. You could tell which people hung out with who by what groups formed that night for talking. The jocks and preps toward the front and the fringe and losers in the back. But I will say that the groups moved amongst each other better than back in the day. The other interesting note was all the people who live around Columbus. I had known of one or two but there was quite a few more than I realized. The other thing that I did this past weekend was to visit my Mom. She had recently reconnected with my grandmother and was able to pass on my request for some pictures of my Dad. 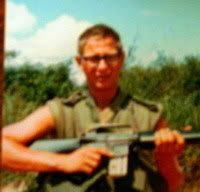 He was killed in Vietnam back in 1968 and I had one or two pictures. 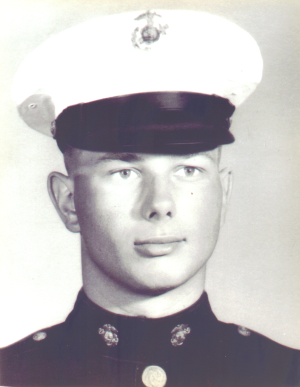 My grandma had some copies made of an 8 x10 of him in his Marine dress blues, a couple of candids of him in his Marine dress greens, one that was taken at his funeral, and couple of him in Vietnam taken by his buddies. Those were pretty cool. I also noticed how much he looked like his Dad. 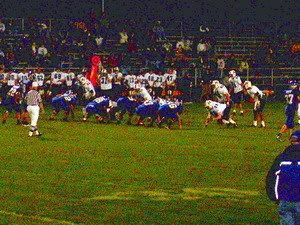 This entry was posted in Findlay, Football, Life and tagged Findlay High School, reunion, Vietnam on September 25, 2006 by Doug.